A single Azure function is all it took to fully implement an end-to-end, real-time, mission critical data pipeline. And it was done with a serverless architecture. Serverless architectures simplify the building, deployment, and management of cloud scale applications. Instead of worrying about data infrastructure like server procurement, configuration, and management a data engineer can focus on the tasks it takes to ensure an end-to-end and highly functioning data pipeline. 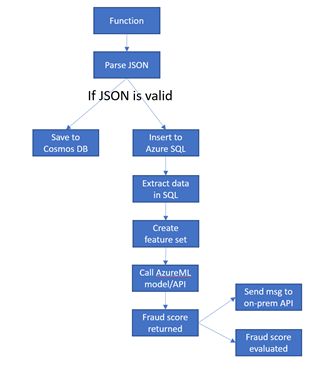 This blog describes an Azure function and how it efficiently coordinated a data ingestion pipeline that processed over eight million transactions per day. A large bank wanted to build a solution to detect fraudulent transactions submitted through mobile phone banking applications. The solution requires a big data pipeline approach. High volumes of real-time data are ingested into a cloud service, where a series of data transformation and extraction activities occur. This results in the creation of a feature data set, and the use of advanced analytics. For the bank, the pipeline had to be very fast and scalable, end-to-end evaluation of each transaction had to complete in less than two seconds. An enterprise system bus sends bank transaction in a JSON file that arrives into an Event Hub. The arrival triggers a response to validate and parse the ingested file. A SQL stored procedure is invoked. The procedure extracts data elements from the JSON message and aggregates them with customer and account profiles to generate a feature set, which is the input for a machine learning model. The aggregated message is formatted as a JSON file. The validated JSON message is written to Cosmos DB. A machine learning model is invoked to evaluate and score the transaction. The fraud score is posted back to an on-premises API for integration to a case management solution. 1. A method is triggered when an event is received by an Event Hub. 2. The message is processed, and the JSON is validated. 3. Invoke code to execute a SQL command to insert the message event. 4. If the JSON message is valid, save it to Cosmos DB for purposes of querying later. 5. Once the JSON is parsed, extract the relevant attributes. 6. Execute a stored procedure to create the features that will be the input to the machine learning model. 7. 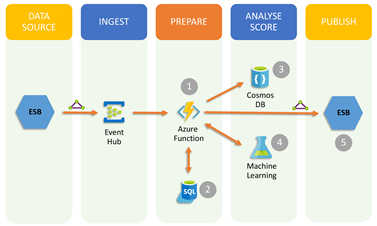 Invoke a call to the Azure ML services endpoint. Obtain a score from Azure ML. Pass in the input parameters. 8. The ML service returns a score which is then processed. 9. Make a call to the on-premises system, passing the message as an argument. 10. The score is evaluated against a threshold, which determines if it should be passed on to the on-premises case management system. The figure below shows the logic as a vertical set of ten blocks, one for each task in the code. Azure Autoscale is a capability built into cloud services like Azure Functions. It is rules-based and provides the ability to scale a service like Azure Functions up or down based on defined thresholds. By default, because of the volume of data ingested into Event Hubs, the Azure Functions service scaled too quickly, and created too many instances of itself. That resulted in locking issues on the Event Hub partitions, impacting throughput significantly. After experimentation with autoscale feature, the setting for the Functions service was set to a minimum of one and a maximum of four instances. maxBatchSize: Gets or sets the maximum event count that a user is willing to accept for processing per receive loop. This count is on a per-Event Hub partition level. prefetchCount: Gets or sets the number of events that any receiver in the currently owned partition will actively cache. The default value for this property is 300. // The maximum event count received per receive loop. The default is 64. // The default PrefetchCount that will be used by the underlying EventProcessorHost. // The number of event batches to process before creating an EventHub cursor   checkpoint. Optimize the performance and reliability of Azure functions. Get started with Autoscale in Azure. The full architecture for the bank fraud solution referenced in this blog can be found here: Mobile Bank Fraud Solution Guide. Special thanks to Cedric Labuschagne, Chris Cook, and Eujon Sellers for their collaboration on this blog.